Recently I was stuck on a tarmac in a plane. I remember feeling anxious to get home to my family and frustrated that we were wasting time because the airport didn’t plan their take off schedule effectively. If I really considered where my anxiety was coming from, it was because I was in a situation I didn’t want to be in and I had no control over it. No matter how much we like to feel in control, things do not always go according to plan. That’s a part of life. I could have spent that 20 minutes getting worked up and more anxious the longer we sat there without moving. By recognizing that I had no control over how soon I got home, I knew the best choice was to accept what it was and then choose how to best spend my energy. I chose to take a nap and talk to my neighbor. Would I have traded that to get home a half hour sooner? Absolutely; however, in choosing to accept what I couldn’t change and, in essence, make the best of it, I freed myself from spending the remainder of the flight feeling anxious and frustrated as the minutes passed. David Richo wrote a book I often recommend to clients struggling with anxiety, The 5 Things We Cannot Change, based on his development of the five unavoidable givens – five facts of life over which we are powerless. They are five of the most difficult truths to accept; they are facts we spend a lot of time and energy trying to control. Principals of radical acceptance suggest is it helpful to acknowledge the situation without judging what is happening or criticizing. Radical acceptance does not mean that we agree with what is happening in our lives or that we like it, it simply means we are choosing to acknowledge. Letting go of things we cannot control can actually create a sense of freedom and happiness. If we are willing to accept that life is not always fair and that reality is beyond our control, we are able to let go, believe in our own resilience and have faith in the bigger plan instead of suffering through anger, resentment and grudges. All things, both good and bad in life, evolve, change and inevitably end. By accepting this fact we allow ourselves to practice mindfulness, appreciating where we are in the moment. It’s like the old saying, “Things go best for those who make the best of things.” It’s hard to accept when things don’t go the way we are hoping but by accepting this fact of life we are able to discover the best of things without being hindered by resentment and fear. Pain is hard. Accepting pain and moving through it is even harder. If we are able to the acknowledge the pain, we can allow ourselves to feel it and heal and grow from it instead of being stuck trying to control it or stuff it down. By recognizing no matter what we do, people will not be loving and loyal all the time, we let go of the need to hurt or reject those who have disappointed us. We are able to think more clearly about what is and how we can set boundaries within our relationships moving forward. Take a moment to think about the last time you were anxious or frustrated. Did the situation fit into any of these five categories? Consider how your perspective and ultimately your emotions might have changed if you had accepted that fact instead of fighting to control it? 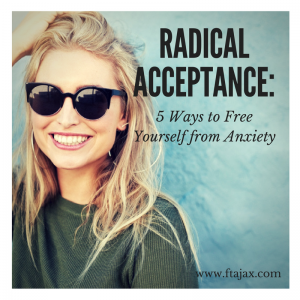 One of the most helpful tools in treating anxiety is learning to shift your perspective and practicing radical acceptance. If you are struggling with anxiety and would like to learn more tools to manage your anxiety, contact us, we are happy to answer any questions you may have about individual counseling or treatment for anxiety. Our therapists, Kristen Montiel and April Evans specialize in treating anxiety.